Not many things beat the smell of fresh coffee in the morning, except maybe the taste of a smooth shot of espresso or a cappuccino just how you like it; especially when it's coming from the best espresso machine you can buy. Whether its part of a pre-commute morning routine or you’re reluctantly heading back upstairs to commence the working day in your home office, having the facilities to make your own great espresso at home will perk up your morning routine. 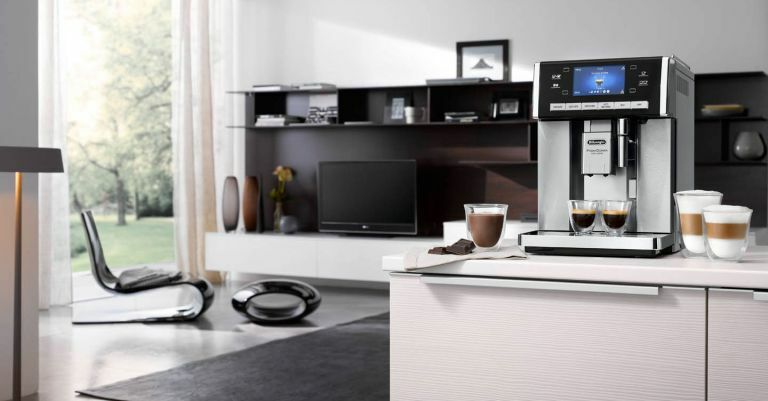 So, why not start your morning with a drink brewed in the very best espresso machine you can buy for your home? Not a big fan of espresso? Find our pick of the very best coffee machines of all types. If you're looking for a bargain, the best cheap coffee machine deals are right here. Buying a barista style coffee twice a day from your local coffee shop will cost around £3 a pop and so at least £30 every working week. That means even the most expensive espresso machine on our list will pay for itself in less than a year. Otherwise known as a water tank, the reservoir on an espresso machine doesn't necessarily need to be large; its size should depend on how many people will be using the machine and how often. Essentially the amount of pressure used to push water through the coffee grounds/beans; the higher the number, the higher the pressure. The best espresso is said to be produced at 9 bars. Does it have a grinder? Important if you're wanting to use coffee beans, however a grinder will more often than not bump up the price up of a coffee machine. Available in all shapes and sizes, from the sleek and modern to the traditional and slightly wacky, there’s always the option to choose a machine that fits in your space and is in sync with your existing decor. Expensive espresso coffee machines may have a grinder incorporated into their design, with De’Longhi and Sage by Heston Blumenthal giving you the option to grind your coffee beans to your preferred consistency. Less expensive espresso machines may lack the capability to grind coffee beans, but there’s a diverse market of pre-ground coffee from around the world to tap into. So, in no way are you compromising on that first sip satisfaction just by investing in the slightly less expensive but ever-so retro Smeg espresso machine that features on our list, for example. Heston Blumenthal is a chef renowned for his wacky recipes, so it’s no surprise that his coffee machine is just as out there, with its ability to grind beans to your preferred consistency, apply just the right amount of pressure for a smooth espresso and steam milk to the perfect level of frothiness. Despite its advanced features, it’s very traditional in appearance, with a clean, stainless steel exterior that’ll look great against the backdrop of any kitchen style. For its futuristic capabilities and loyalty to a traditional barista espresso machine, we give Sage our number one spot as the best espresso machine. This machine can make a single or double shot of espresso even a barista would be proud of, and is our top pick of the best affordable espresso machines. Compatible with ground coffee or coffee beans thanks to its integrated stainless steel grinder, it offers two pre-programmed coffees at the touch of a button. It also has a memory function to remember your drink choices, and for those who like froth with their espresso, there's the opportunity to add a steam wand to the machine when purchasing. Its touch LCD display makes an easy job of working the machine, and its shiny black exterior means it'll look sleek on your kitchen counter. The best part? You'll never have to worry about maintenance as it has a Rinse Clean function to ensure it's always performing at its best. Streamlined in its appearance, this espresso coffee machine combines black and silver for a sleek and modern presence in your kitchen. The machine is fairly compact in size, so it shouldn’t take up too much room in your kitchen, but it’s capacity to freshly grind coffee certainly gives it an edge over the Smeg product featured earlier. You can pre-set three cups and two coffee strengths – strong for the morning and perhaps a weaker one for coffees at the end of a meal. Just note that there is no steaming arm, so it lacks the theatrics of other espresso machines in our list. In our opinion, this is the best espresso machine for those who are looking for something modern. This espresso coffee machine blends the convenience of the capsule coffee machine with the authenticity of a bean to cup. The machine can either grind coffee beans or you can choose a pre-ground blend of your choice. Making a latte, cappuccino or macchiato is easy as pressing a button, and you still benefit from the perfectly frothed milk and smooth shot of espresso that espresso coffee machines are renowned for. With its stainless steel and black exterior, it’s smart, streamlined and will certainly look the part taking pride of place in your kitchen. Not every kitchen has all the space in the world, so this small, yet perfectly formed coffee espresso machine will fit in perfectly, and especially well if retro gadgetry is a theme in your household. Perhaps the only negative is the compromise of a grinder, but that doesn’t mean you can’t explore and stock up on the finest Colombian pre-ground coffee. Because there’s no grinder, this machine is more compact and available at a friendlier price, and there’s still a variety of colours to choose from, including black, cream, red and pastel blue. If you're after a retro look, this is the best espresso machine you can buy. If you like the look of our first pick, but require a machine more modern in appearance, this Gaggia espresso coffee machine could be the answer. It’s not as refined in its grinding capabilities, but there are five settings so you can achieve a pretty perfect blend. As an ideal all-rounder, it features a steamer, as well as a grinder, all for a much friendlier price than the Sage. If you’re looking for a way to make a quick and efficient coffee in the morning, it boasts a quick heat boiler and many of its elements are dishwasher proof.